Here to Serve Someone You Care About? Whether you wish to help a friend, loved one, or even a stranger in medical crisis, you are in the right place! Welcome to Here to Serve's customized Care Communities powered by Lotsa Helping Hands! Share well wishes, view medical updates, or volunteer to help with meals, household chores, transportation, child or pet care, etc. No matter what, you will find Here to Serve's Care Communities the best way to stay informed and become involved. Look to the left. 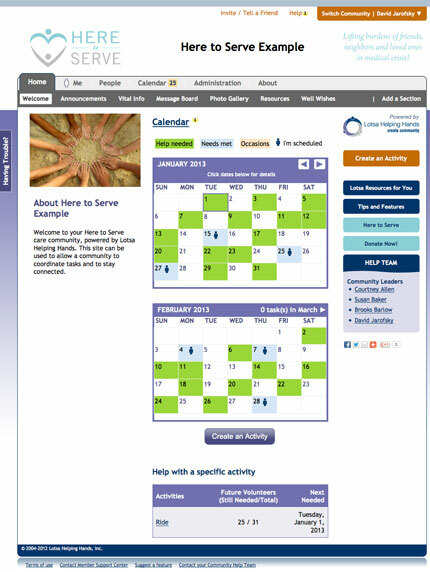 Learn how Here to Serve's Care Coordinators customize Care Communities to the needs/wishes of your friend or loved one. Use the calendar to sign up to help. As you volunteer, you will receive email reminders when the time comes to help! If you provide a meal, learn about any food restrictions or meals they like. Maybe the family has chosen to do a blog or daily journal. All this and more can be part of the Care Community! Simply stay informed, or choose to be more involved by volunteering and funding much-needed services. Many choose to do both! Life changes and there is little we can do about it but find love and meaning with the people who we are connected to and touch. Thank you for responding to the call to serve!